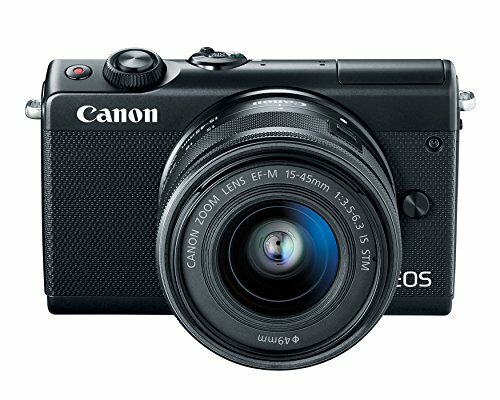 Canon EOS M100 is the stylish, compact and powerful mirrorless interchangeable lens camera in EOS M family. Best for selfies or capture life’s special moments with beautiful color and detail as well as the easy-to-use interface. It packs with a powerful 24.2 Megapixel APS-C CMOS sensor that helps you to capture high-resolution images in a wide variety of lighting situations, DIGIC 7 image processor for fast operation, and Canon’s impressive Dual Pixel AF system which offer fast, smooth and precise autofocus. The camera has an intuitive 3.0-inch touchscreen LCD, approximately 1.04 million pixels which can pivot a full 180 degrees for a perfect selfie or capture a unique low angle view with an easy-to-use interface. The M100 supports full HD video recording at 1080/60p and has a full set of wireless features including built-in Wi-Fi, NFC, and Bluetooth for upload your pictures to all your social media world. Self Portrait mode helps your adjustments from smooth skin tones and background blurring to brightness and more to make sure your selfie captures looking best as possible. The EOS M100 camera uses Canon’s EF-M mount and can use Canon EF^ and EF-S^ lenses via an optional adapter. This gives access to dozens of different creative choices that suit whatever style of photography. 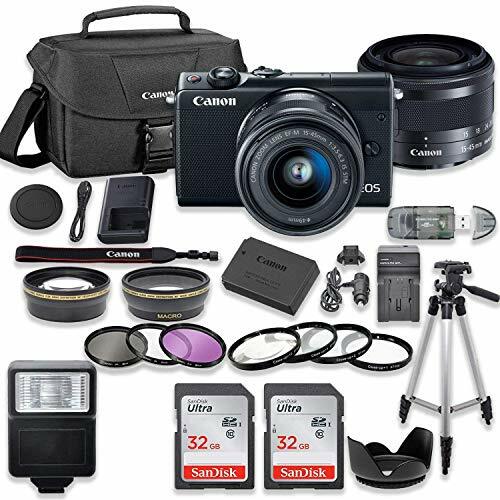 Stylish, compact and powerful mirrorless interchangeable lens camera in EOS M family. Easy-to-use interface, best for selfies or capture life’s special moments with beautiful color and detail. The Canon EF-M 15-45mm f/3.5-6.3 IS STM Lens from Canon offers a 24-72mm equivalent focal length range when used with APS-C-format EOS M-series mirrorless cameras. The lens placement has also been optimized, and coatings have been applied, to reduce flare and ghosting for increased contrast and clarity when photographing in difficult lighting conditions. Canon EF-M 15-45mm f/3.5-6.3 IS STM Lens - EF-M Mount lens which offers a 24-72mm equivalent focal length range when used with APS-C-format EOS M-series mirrorless cameras. The lens placement has been optimized, and coatings have been applied, to reduce flare and ghosting for increased contrast and clarity when photographing in difficult lighting conditions. 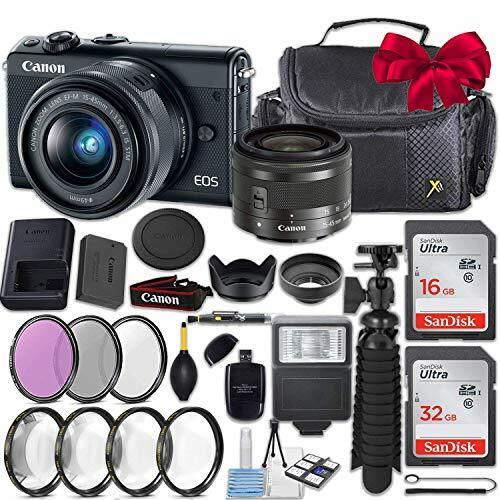 In addition the bundle includes Spider flexible tripod, 2 lens hoods, flash light, Soft padded camera case, Canon original battery, Canon original battery charger, Canon camera strap, Body & lens caps..